The name , by which people know me in Mumbai, is Vidur. My real name is Kamal Nayan Chaturvedi. Deoria ( U. P. ) is my birth place. I did post graduation in English Literature from Allahabad University in 1974. I am an acting trainer in Mumbai since 1990. 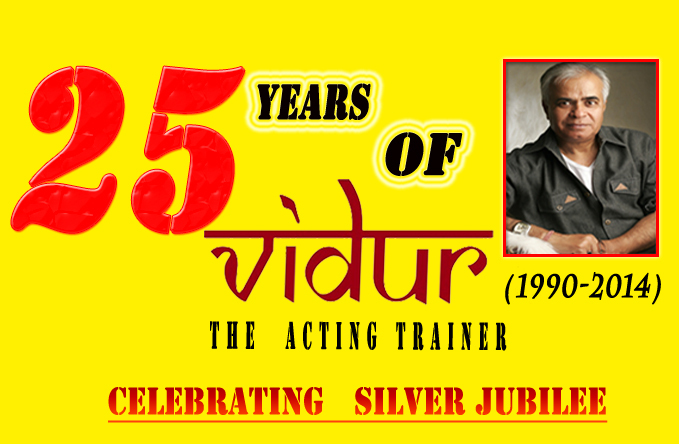 On September 21 , 2012 , I opened my acting institute in Mumbai , which is known as VIDUR Acting Institute . I have co-directed a Marathi movie = " BHAKTI HEECH KHARI SHAKTI " I have written 2 books = ! - Swayam Vadya Swayam Vadak 2 - Bhasha Aur Uchcharan Currently I am writing my third book on acting . In 2010 wrote script of a Bhojpuri Film " ABER ". Planning to direct it soon . The big day is here. 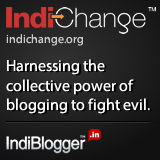 Completing 9 years of continuous blogging. My Association With " Student Of The Year "
MUMBAI – MAHARASHTRA – INDIA OCTOBER 23, 2015 00.45 A.M. I follow Shri Tarun Chugh on Twitter. He is a BJP leader from Punjab and is in-charge of Andaman & Nicobar Islands. He tweeted about victory of 19 PIOs [ Persons of Indian Origin ] in the 2015 parliamentary elections of Canada. Results were declared on October 19, 2015. Out of these 19 MPs, there are 5 Punjabi females, 5 Sikhs, 7 mona Punjabis and remaining 2 are others. There is one Ms. Anju Dhillon, who created history by winning from Quebec, the French-speaking province of Canada. I felt proud and happy. My knowledge of Canada began when I read about the 1914 episode of Komagata Maru in history chapters. But my earliest personal memory of Canada dates back to 1968, when Pierre Trudeau, riding on the unprecedented wave called “TRUDEAUMANIA” , won the Canadian parliamentary elections and became the prime minister. 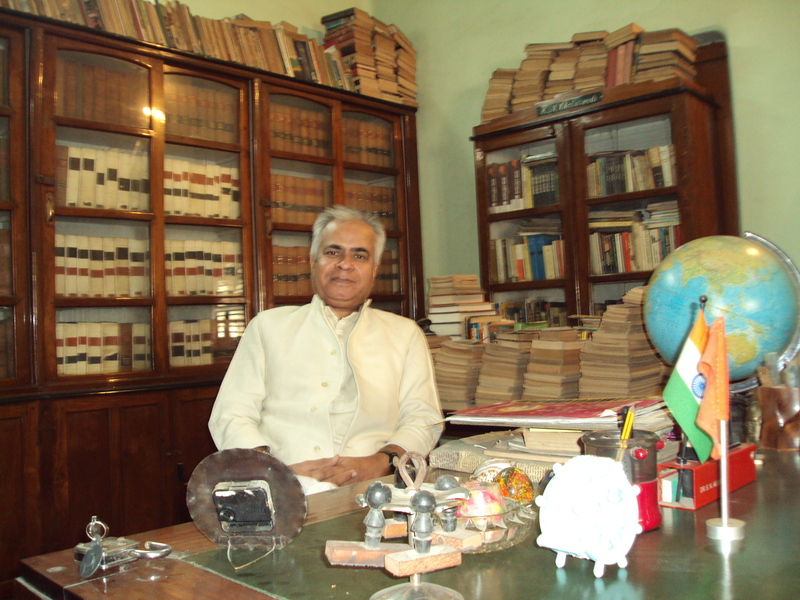 I had left my native place Deoria, Uttar Pradesh in 1967 and got admitted in the Government Inter College, Allahabad. I had already started taking interest in world affairs. So Pierre Trudeau and Trudeaumania was a new revelation for me. Trudeau was prime minister till 1984. 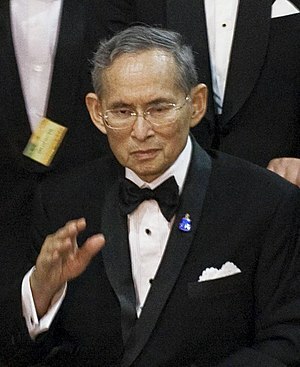 Barring a brief interruption, he was prime minister for unprecedented 16 years. He lost the elections because of his wife Margaret. I still remember article about him in DINAMAN, a popular political weekly of those days [ Trudeau ki Triya : Wife of Trudeau ] After his defeat I got entangled in my personal affair and lost touch. My 1st honeymoon with Canada ended with Pierre Trudeau’s departure. My 2nd affair with Canada started when I came Mumbai in 1989 and started my life as an acting trainer. I have 4 students from Canada till date. My 1st student is MIA EVONNE UYEDA, a French origin Canadian. Then I have 3 other students, Canada nationals of Indian origin. They are : AVNEET GILL, PAMMI BRAR & SAPNA SEHRAVAT. My 3rd honeymoon with Canada started this year with the highly successful tour of our prime minister Narendra Modi. I watched his community reception in RICOH COLISEUM, TORONTO on April 15, 2015. I was enthralled by the vigour and energy of the Indian diaspora. I felt proud. I thought its going to be the last Canadian chapter in my life. But history plays unknown, unpredictable games with us. I never knew that Pierre Trudeau will visit my life one more time. He will visit rather pretty soon. And as I stated in the beginning, I came to know about 19 victorious MPs of Indian origin in recently concluded parliamentary elections. When I read the victorious leader’s name, I just smiled. Its none other than Justin Trudeau, the eldest son of Pierre Trudeau. 31 year after Trudeau senior’s retirement, his son returns as the triumphant leader of his father’s Liberal party. He trounced and ended a decade long rule of Stephen Harper, the Conservative leader. New Democratic Party, the eternally 3rd NDP remains 3rd. I remembered Justin Trudeau and hid daughter’s picture with our prime minister Narendra Modi. While writing this blog, I am smiling and remembering Pierre Trudeau, who apart from Comagata Maru, was my 1st interest in Canadian history. And now his elder son Justin Trudeau makes me a fan because he leads a parliament, which has 19 MPs of Indian origin. Long Live Indo-Canada friendship !! Indian Canadians are just 3% of Canada’s population. But they are 8.15% of the 184 victorious Liberal MPs. On behalf of all the students & staff of VIDUR Acting Institute , VIDUR Editing Studio , VIDUR Club and VIDUR Merchandise, I congratulate 19 victorious Canadian MPs of Indian origin. MUMBAI – MAHARASHTRA – INDIA MARCH 04 , 2014 00.30 A.M.
Never in my wildest dreams I had imagined that one day , I would be sitting in Mumbai and writing a blog about Crimea. 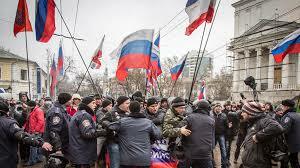 I know this name ” Crimea ” will not ring a familiar bell for majority of my countrymen. But students of world history know about Crimea . I , as a student of history , have read about Crimean War [ 1853 – 1856 ] in detail . Much before World war I [ 1914 – 1918 ] , French Empire , Ottoman Empire , British Empire and Kingdom of Sardinia fought a bloody and fierce battle with Russian Empire over the right of Christians in Holy Land . Allied forces fought for Roman Catholics and Russian Empire fought for Orthodox Church . Crimean war , fought between October 1853 to February 1856 , resulted in the victory for Allied Forces and finally Treaty of Paris was signed between the victors and the vanquished . Crimean War had far-reaching effect in the history of mankind. It will aways be remembered for Florence Nightingale and her pioneering service for the wounded in the war . Her work heralded the modern nursing methods . It is a little known fact that Mahatma Gandhi won Victoria Cross for his services for the British Empire during Crimean War . It is also a fact that in the aftermath of Crimean War , because of heavy financial crisis and huge debt , which he was unable to pay , Alexander II , the Czar of Russia sold Alaska region of Russian Empire to U.S.A. Alaska was admitted as the 49th state of USA on January 3, 1959 . 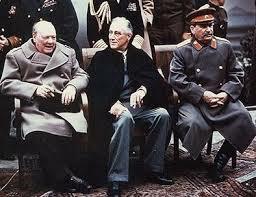 As a student of history I have read about Yalta Conference of February 1945 , a.k.a. Crimea Conference , and many more pages of Crimean history during World War II . By strange quirk of history and unlike Crimean War , British Empire and Russian Empire were not at loggerheads during World War II but they were fighting together as the Allied Forces along with United States of America . Franklin D. Roosevelt of U.S.A. , Winston Churchill of Great Britain and Joseph Stalin of Russia assembled at Yalta , a port city of Crimea and discussed and decided Europe’s Post – War reorganization . So when I read about the recent turmoil in Crimea , I was alarmed and concerned . 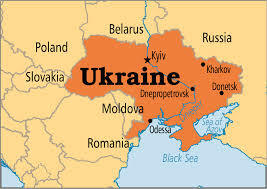 I just wrote and posted a blog about Ukraine . I was celebrating the success of nationalist forces of Ukraine and the fall of pro – Russian Ukrainian President and a tyrant Viktor Yanukovich . But alas , it was short – lived . Viktor Yanukovich took refuge in Moscow and Russian forces slyly entered into the Simferopol , the capital of Crimea , and took control of the airport and other vital government installations . Crimea is a peninsula and is attached to Ukraine by a narrow stretch of land which is at places not more than 5 km in width. 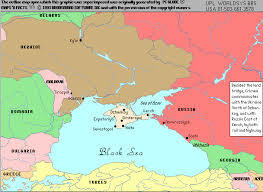 For centuries Russian Empire was struggling to have a foothold in the warm water of Black Sea for her navy. With the decline of Ottoman Empire , and after the end of Crimean War , Russian Empire annexed Ukraine and Crimea and these regions first became part of Russian Empire and later on a Soviet Republic of USSR [ Union of Soviet Socialist Republic ] . Ukrainian Cossacks and Ukrainian Tatars [ Muslims ] resented the Russian sovereignty but to no avail . From 1922 to 1945 Crimea remained a part of USSR as the Autonomous Soviet Socialist Republic . On February 19 , 1954 , the Presidium of Supreme Soviet of USSR transferred Crimean region to the Ukraine Soviet Socialist Republic . And thus from 1945 to 1991 , Crimea remained a part of Ukraine . As I have stated in my earlier blog about Ukraine , in 1991 USSR was disintegrated and Ukraine , along with 14 other republics became independent country . 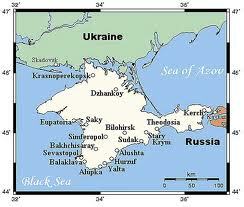 In 1991 Crimea became a part of Ukraine as the Autonomous Republic of Crimea . This is the brief history of Crimea . Things started changing fast and situation became fluid after the fall of pro – Russian president of Ukraine , Viktor Yanukovich . 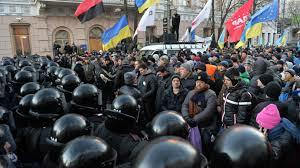 On February 26 , 2014 pro – Russia and pro – Ukraine protesters clashed in front of the parliament building in Simferopol . Russian parliament granted President Vladimir Putin the authority to use military force in Ukraine . And because of his unbridled ambition to regain the lost glory of Russian Empire , President Vladimir Putin wants to exercise this new-found authority . He simply forgets that in 1994 Russia backed the legal status of Crimea as part of Ukraine and signed a treaty with United States of America , United Kingdom and France and pledged to uphold the territorial integrity of Ukraine . This treaty was ratified in May 1997 and Russia finally accepted Ukraine’s present borders and Ukraine’s sovereignty over Crimea and Sevastopol . He is emboldened by the fact that Ethnic Ukrainians make up only 24 % of the population , Ethnic Russian 58 % and Ethnic Tatar Muslims 12 % . And this 58 % Russian population is urging Russia to intervene and take control of Crimea and govern Crimea . 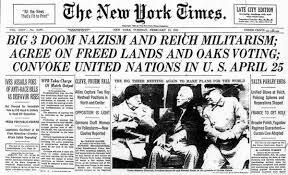 They was to secede from Ukraine . And Vladimir Putin is more than willing to oblige . On behalf of all the students and staff of VIDUR Acting Institute , I express my solidarity with the Ukrainian people , with the Crimean people . VIDUR Editing Studio , VIDUR Club and VIDUR Theatre would also like to wish them well and pray for their glorious future ahead . MUMBAI – MAHARASHTRA – INDIA FEBRUARY 24, 2014 01.30 A.M.
Two years ago, on February 01, 2012 , I wrote a blog about Ukraine , a former Soviet republic and a very little known country in India. It was titled ” Sorry Ukraine , My Apology “ and was written when a group of Ukrainian women demonstrated naked in front of Indian embassy in Ukrainian capital of Kiev . Two years later, I am again writing about Ukraine and this time matter is more serious. 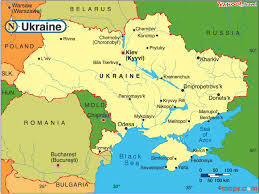 Ukraine was a Soviet Republic before becoming a sovereign country. As every one knows on December 26, 1991 , USSR [ Union of Soviet Socialist Republics ] was dissolved and 15 independent countries came into being. Even after dissolution of USSR , some former Soviet republics retained and maintained close links with Russia. Some republics formed Eurasian Economic Community and retained close links with Russia in the form of economic and security cooperation. 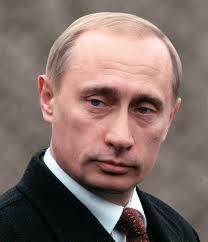 It is alleged that Russian President Vladimir Putin secretly wants to re-establish the former USSR . He knows that his dream is almost impossible to accomplish, so he encourages friendly leaders in the former Soviet republics to become close allies. He wants them to join Eurasian Union and thus help him retain some of the old glory. In his scheme of things Viktor Yanukovich, the president of Ukraine , was the most important ally. Ukrainian people read the writing on the wall and saw the signal. For majority of Ukrainian people Ukraine’s president Viktor Yanukovich was not more than a stooge of Vladimir Putin , who wanted Ukraine to become a satellite of Russia. People of Ukraine on the other hand wanted to move away from Russian orbit and wanted to get closer to Europe. Sensing trouble, Viktor Yanukovich started reign of oppression. He ruled Ukraine with iron fist, jailed former Prime Minister Yulia Tymoshenko and moved dangerously close to Russia. 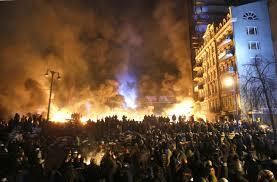 Ukraine erupted in defiance. They fought a bloody battle . 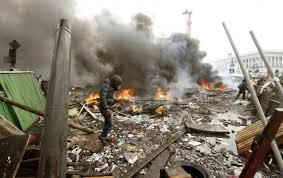 Kiev became a war zone. 77 people got killed. Dictator Viktor Yanukovich first tried to suppress Ukraine . But in these days of internet and other social networking sites it is not easy. 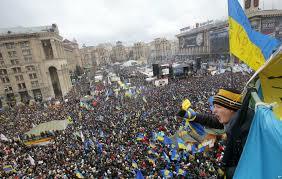 Ukrainians remained defiant. They fought police and army. Ukraine wanted to get rid of the dictator. Following pictures show their resolve. 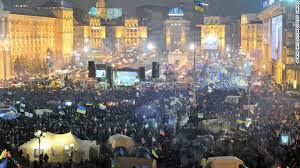 Ultimately Ukraine’s parliament voted on February 22, 2014 in favour of removal of Viktor Yanukovich from the post. 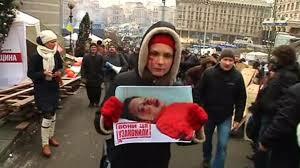 Viktor Yanukovich denounced this as coup against his regime and left his office in Kiev and disappeared . Ukraine’s parliament promised new elections and formation of a new government . Police of Ukraine and Ukrainian army declared that they are with the protestors and are not going to fight their own people. While I am writing this blog rapid changes are being seen in Ukraine. Former prime minister and opposition leader Yulia Tymoshenko was freed from the jail and fresh election has been ordered on May 25. Ukraine turns a new page in her history. World is watching. The Russian stooge is gone and with his unceremonial departure dreams of Vladimir Putin evaporates in the thin air. Long live Ukraine ! Long live people of Ukraine ! Long live struggle for freedom ! Long live struggle for democracy ! 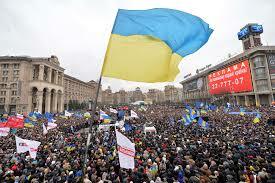 On behalf of all the students and staff of VIDUR Acting Institute , I express my solidarity with the Ukrainian people. 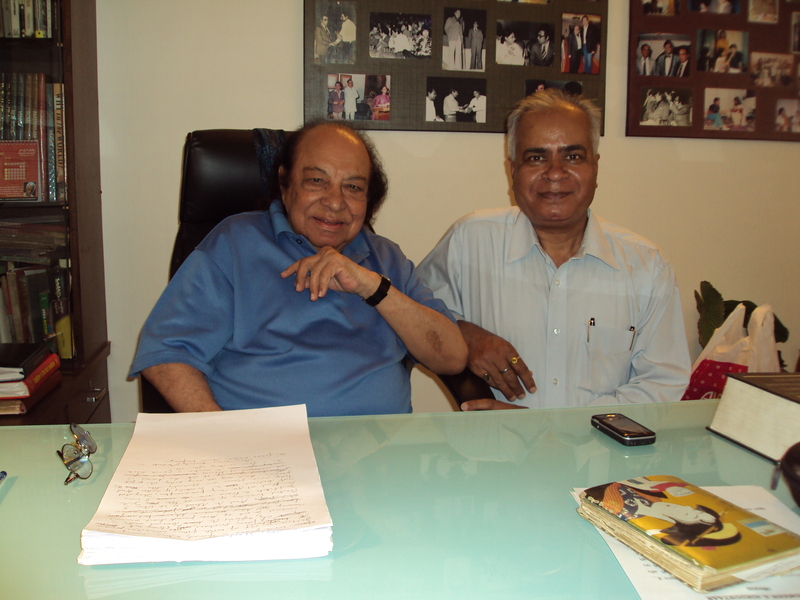 VIDUR Editing Studio , VIDUR Club and VIDUR Theatre would also like to wish them well in their glorious journey ahead . 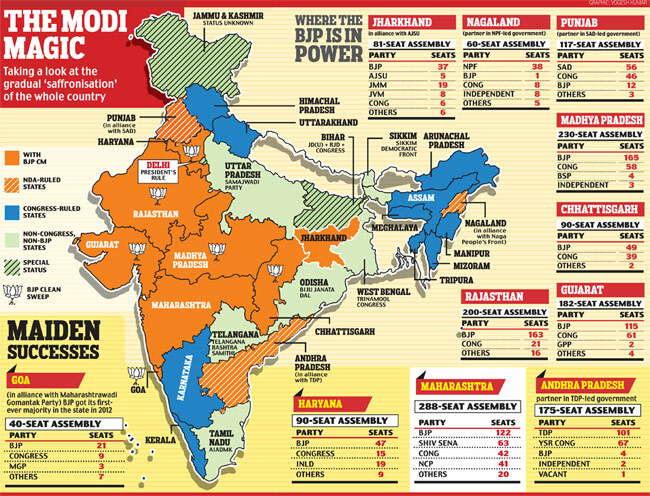 MUMBAI – MAHARASHTRA – INDIA FEBRUARY24 , 2013 11.00 P.M.
Indian subcontinent seems to be in turmoil these days . Pakistan is perennially unstable and is always on the brink and now Bangla Desh also seems to be stirred and shaken . The latest target in both the countries are social networking activists . Barely few months back in October 2012 , Malala Yousafzai of Pakistan was shot in the head by the Talibans . Now she is out of the hospital but still faces the threat . She is an avid blogger and posts her thoughts regularly . 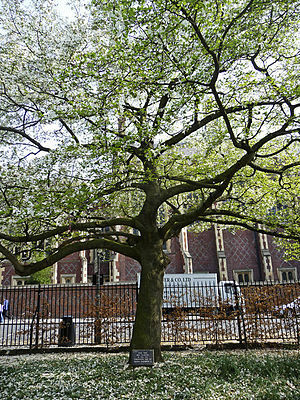 Her crime was that she wanted to pursue studies and was voicing her views through her blog . And now the news come from Bangla Desh . A blogger , Ahmed Rajib Haider , is hacked to death allegedly by Jamaat – E – Islami fundamentalists . His only fault is that he is also a blogger and through his blogs he was raising voice against rising fangs of Islamic fundamentalism in secular Bangla Desh . His another crime according to jamaat – E – Islami clerics is that he proclaimed through his blog that he is an atheist . Majority of Bangladeshis think that hacking of Ahmed Rajib Haider is the handiwork of Jamaat – Shibir , the youth wing of the Jamaat – E – Islami . Bangla Desh is in turmoil since long . People are up in arms for the justice of the victims of 1971 Liberation War .What is now known as Shahbagh demonstration , almost 500 people gathered on February 05 , 2013 to protest against the life sentence to Jamaat leader and accuse of 1971 war criminal Abdul Qader Mollah . They were demanding death sentence for Mollah . In Bangla Desh it is widely and universally believed that Jamaat actively helped Pakistan army during the 1971 war of independence . February 05 , 2013 Shahbagh Demonstration was organised through facebook and other social media . Youngsters who were apolitical earlier , are now actively participating in demonstrations and voicing their views . Social networking sites have given them an easy tool in hand . Clamour for punishing Jamaat for their alleged crime during 1971 war of independence are growing . So naturally Jamaat , to save their skin , is trying to term these activists as anti – Islamic and atheists . So they first attacked a blogger Asif Mohiuddin . He was stabbed but he survived . 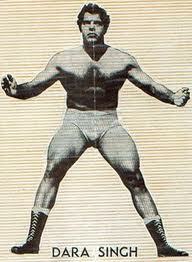 Now Haider becomes the second victim of attack and he died . It is very unfortunate . If Jamaat is found guilty by courts for the crimes during war of independence , they should accept the verdict and face the consequences . But they are trying to save their skin by muzzling voices of dissent . Hacking people to death will not help them now . Social networking sites are here to stay and they have become an easy and convenient tools in the hands of young dreamers . They wont be silent now . Forces like Jamaat – E – Islami should understand this . Otherwise very soon they will be extinct . I think , as a conscientious citizen , it is my duty to ponder and comment on the happenings of the world . I also try to inculcate these feelings in the students of my acting academy Vidur’s Kreating Charakters . Like some others , I cannot think just about my next batch and proclaim from my housetop that mine is the best acting academy of India , best acting institute of Mumbai or the best acting class of bollywood. My acting students should be world citizens and they should think about the happenings of the world . MUMBAI – MAHARASHTRA – INDIA JANUARY 16 , 2013 07.55 P.M. Birth of Al – Qaeda and demolition of World Trade Centre in New York could be called water – shed moments in the history of modern world . It spawned many Jehads by Al Qaeda against the ” Satanic Western powers ” and several wars by the Western powers to safeguard the world from the ” Islamic menace ” . War in Afghanistan and killing of Osama Bin Laden are well chronicled and thus need no repetition . But when I read about the recent attack on Mali by French army , I was forced to consult Wikipedia for the history of Mali , as I was not very much familiar with the history of Africa in general and Mali in particular . 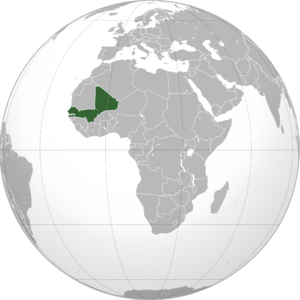 Republic of Mali , is a landlocked country in West Africa . Mali is bordered by Algeria on the north , Niger on the east , Burkina Faso and Côte d’Ivoire on the south , Guinea on the south-west , and Senegal and Mauritania on the west . Its capital is Bamako . Mali consists of eight regions and its borders on the north reach deep into the middle of the Sahara, while the country’s southern part, where the majority of inhabitants live, features the Niger and Sénégal rivers. The country’s economic structure centers on agriculture and fishing. Some of Mali’s prominent natural resources include gold and salt. About half the population lives below the international poverty line of US$1.25 a day. Present-day Mali was once part of three West African empires that controlled trans-Saharan trade : the Ghana Empire , the Mali Empire (from which Mali is named), and the Songhai Empire . During its golden age , there was a flourishing of mathematics, astronomy, literature, and art .At its peak , Mali was one of the most expansive empires in the world at the time .In the late 19th century, during the Scramble for Africa , France seized control of Mali, making it a part of French Sudan . French Sudan (then known as the Sudanese Republic) joined with Senegal in 1959 , achieving independence in 1960 as the Mali Federation . Shortly thereafter , following Senegal’s withdrawal from the federation , the Sudanese Republic declared itself the independent Republic of Mali . 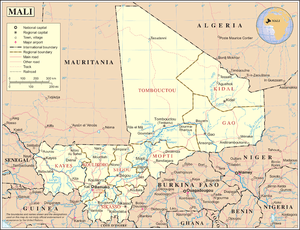 After a long period of one-party rule , a 1991 coup led to the writing of a new constitution and the establishment of Mali as a democratic , multi-party state . A conflict in northern Mali began in January 2012 . On 22 March 2012 , a group of junior soldiers seized control of the presidential palace and declared the government dissolved and its constitution suspended . On 6 April 2012 , rebels from the National Movement for the Liberation of Azawad (MNLA) declared the secession of a new state , Azawad , from Mali . Shortly after, the MNLA were sidelined by Islamist groups associated with Al-Qaeda, and dropped their demands for secession . The soldiers who seized power allowed Dioncounda Traoré , the President of the National Assembly, to take office as head of state in accordance with the constitution , but they have continued to wield considerable power . Plans to re-take the north with international assistance are being formulated , after which the interim government plans to hold the long-delayed national elections . This above mentioned history of Mali is taken from Wikipedia and is being re – produced here . I don’t know what will be the outcome of this war ? I fail to forecast the future of Mali ? Won’t be able to say whether Azawad will be a reality or not ? Will Al Qaeda be rooted out from Mali like Afghanistan or will it succeed here ? Outcome of war is not certain in Mali but it is certain that Mali will not be same again . It is my belief that my students of acting should know the history of our country and the world .I don’t want to declare my acting institute as the best acting institute of Mumbai or the best acting academy of India and not tell my students about the current affairs of the changing world . I don’t want to claim that I run the most successful acting class in Mumbai and my students are illiterate when it comes to world affairs . I want that students of my acting class , Vidur’s Kreating Charakters , should become a better citizen of India and a conscientious denizens of the world . MUMBAI – MAHARASHTRA – INDIA OCTOBER 30, 2012 00.45 A.M.
Year 1962 in general and October 1962 in particular is permanently etched and engraved in my memory for two historical events . First is Chinese invasion of India and the second one is Cuban Missile Crisis . I was 10 years old boy living in Deoria , Uttar Pradesh . My adolescent mind was getting awakened to the happenings of the world . I was curious . I was eager to gather knowledge . I was fascinated by the twists and turns of history . And these two epoch – making chapters of history opened in front of my eyes . 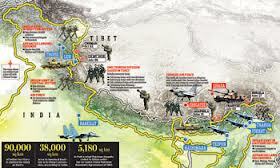 I will write a separate blog about Chinese Invasion of India . Let me concentrate here on Cuban Missile Crisis . Two main protagonists of the drama are now gone . J. F. Kennedy , the then President of U.S.A. got assassinated and Nikita Khrushchev , the then Premier of U.S.S.R. was deposed and subsequently died a natural death . But Comrade Fidel Castro , the then President of Cuba is still alive . His brother Raul Castro , who held parley with Nikita Khrushchev , is now President of Cuba . Let me unveil the incidents of the crisis , which might have escalated into World War III . The Soviet Union sending nuclear warheads to Cuba followed the 1958 deployment by the United States of Thor IRBMs in the UK (Project Emily) and Jupiter IRBMs to Italy and Turkey in 1961 – more than 100 US-built missiles having the capability to strike Moscow with nuclear warheads. 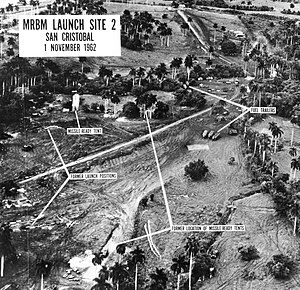 After provocative political moves and the failed US attempts to overthrow the Cuban regime (Bay of Pigs, Operation Mongoose), in May 1962 Nikita Khrushchev proposed the idea of placing Soviet nuclear missiles on Cuba to deter any future invasion attempt. 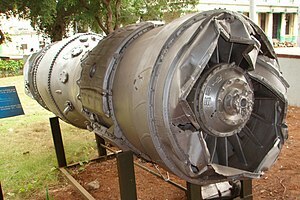 During a meeting between Khrushchev and Raúl Castro that July, a secret agreement was reached and construction of several missile sites began in the late summer. These preparations were noticed, and on 14 October an US U-2 aircraft took several pictures clearly showing sites for medium-range and intermediate-range ballistic nuclear missiles (MRBMs and IRBMs) under construction. These images were processed and presented on October 15, which marks the beginning of the 13-day crisis from the US perspective. 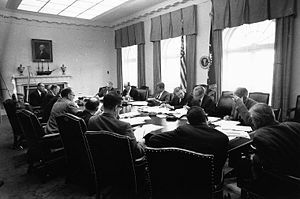 The United States considered attacking Cuba via air and sea, but decided on a military blockade instead, calling it a “quarantine” for legal and other reasons. The US announced that it would not permit offensive weapons to be delivered to Cuba, demanded that the Soviets dismantle the missile bases already under construction or completed, and return all offensive weapons to the USSR. The Kennedy administration held only a slim hope that the Kremlin would agree to their demands, and expected a military confrontation. 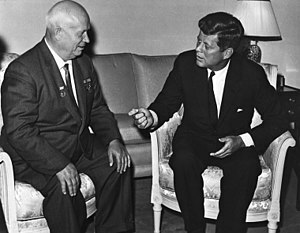 On the Soviet side, Premier Nikita Khrushchev wrote in a letter from October 24, 1962 to President John F. Kennedy that his blockade of “navigation in international waters and air space” constituted “an act of aggression propelling humankind into the abyss of a world nuclear-missile war”.However, in secret back-channel communications the President and Premier initiated a proposal to resolve the crisis. While this was taking place, several Soviet ships attempted to run the blockade, increasing tensions to the point that orders to US Navy ships to fire warning shots and then open fire were sent out. 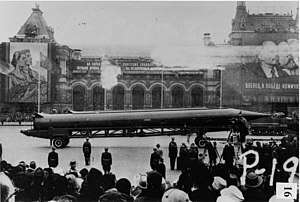 On 27 October a U-2 was shot down by a Soviet missile crew, an action that could have resulted in immediate retaliation from the Kennedy crisis cabinet, according to Secretary of Defense McNamara‘s later testimony. However, in the event itself, Kennedy stayed his hand and the negotiations continued. The confrontation ended on October 28, 1962,when Kennedy and United Nations Secretary-General U Thant reached an agreement with Khrushchev. 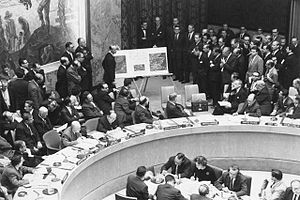 Publicly, the Soviets would dismantle their offensive weapons in Cuba and return them to the Soviet Union, subject to United Nations verification, in exchange for an US public declaration and agreement never to invade Cuba. Secretly, the US agreed that it would dismantle all US-built Jupiter IRBMs deployed in Turkey and Italy. I am quoting the events of the crisis from Wikipedia . Because , though I vividly remember the crisis but day-to-day events in chronological order have been almost obfuscated from my memory . While I was sitting in the office of my acting institute Vidur’s Kreating Charakters , I suddenly remembered those fateful days and decided to write a blog on the topic in the night . I still wonder , what would have been fate of the world in general and India in particular , had the crisis been not diffused in 1962 ? MUMBAI – MAHARASHTRA – INDIA JUNE 07 , 2012 01.40 A.M. I am a student of history and I have studied History of England also . 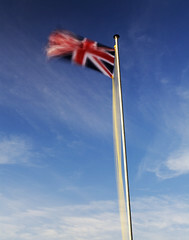 I am quite familiar with numerous kings and queens of United Kingdom . 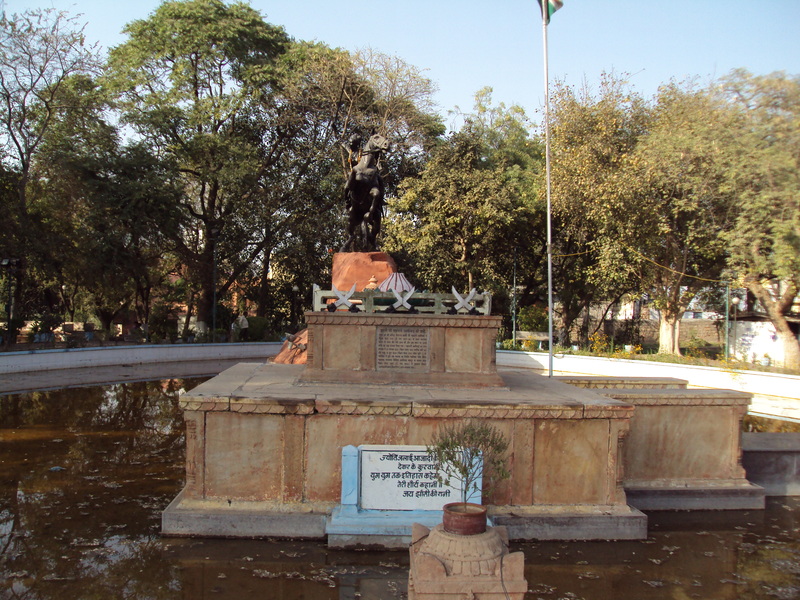 When I was doing post graduation in English Literature , British history was a subject in the University of Allahabad . 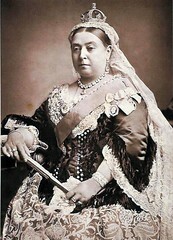 Reign of Queen Victoria always fascinated me . Her reign is epochal and will be remembered because she is the longest reigning monarch in the history of United Kingdom . She ruled for 63 years and 7 months . 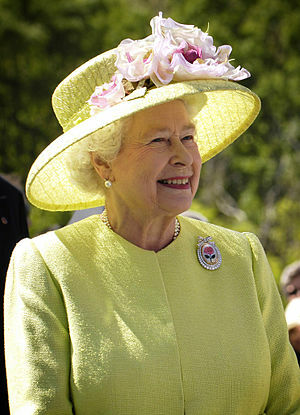 Since Queen Elizabeth II , is celebrating diamond jubilee of her coronation this week , and she has become the 2nd longest reigning monarch of United Kingdom after Queen Victoria , I thought that I must write a blog on this event . She is the longest-lived and second-longest-reigning monarch of the United Kingdom, after Queen Victoria and the second-longest-serving current head of state after King Bhumibol Adulyadej of Thailand , who ascended the throne in 1946 , 6 years before Queen Elizabeth II . For the connoisseurs and students of history , Queen Elizabeth II has other many fascinating records also to her credit . She outlived many Prime Ministers of India and United Kingdom and several Presidents of France and United States of America . During her 60 year-long tenure , India has seen , from Jawahar Lal Nehru to Manmohan Singh , as many as 13 Prime Ministers . Out of these 13 Prime Ministers 09 are already dead . During her tenure , USA saw 12 Presidents . From Harry S. Truman , the 33rd President to the present incumbent Barack Obama , the 44th President , she has seen them all . Out of these 12 Presidents of USA , 7 are already dead . During her tenure , France elected as many as 11 Presidents . Out of these 11 Presidents ; 2 belonged to the 4th French Republic and the rest 9 , including the present incumbent , belonged to the 5th French Republic . She , during her tenure , administered oath of office to as many as 11 Prime Ministers of United Kingdom . Out of these 11 Prime Ministers , many served for more than one term . So for the record , she has seen 11 Prime Ministers of United Kingdom , 11 Presidents of France , 12 Presidents of USA and 13 Prime Ministers of India . 3 more years of her reign and she will eclipse Queen Victoria also as the longest reigning monarch of United Kingdom . 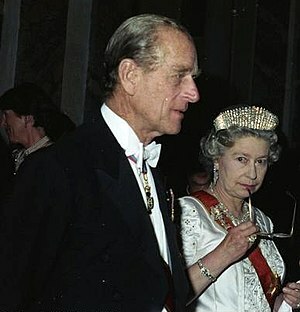 Queen Elizabeth II and Prince Philip, Duke of Edinburgh. 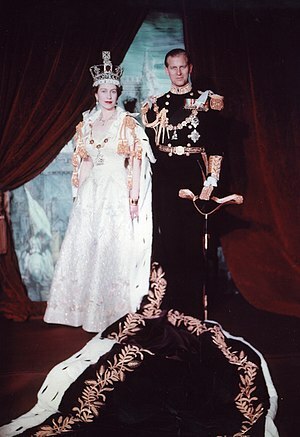 Coronation portrait, June 1953, London, England. 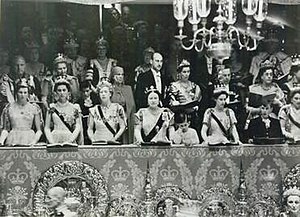 Members of the Royal Family in the Royal box at Westminster Abbey during the coronation of Elizabeth II. Records always fascinate me . Queen Victoria’s reign of 63 years and 7 months [ 20 June 1837 – 22 January 1901 ] , Queen Elizabeth’s reign of 60 years [ 6 February 1952 – Present ] and Thailand’s King Bhumibol Adulyadej’s reign of 66 years [ 9 June 1946 – Present ] is very fascinating for me . I have nothing new or personal things to say about Queen Elizabeth II . 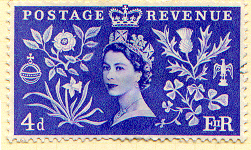 She ascended the throne in 1952 , the year I was born in and she is still there as I am a 60-year-old man . I did watch her celebrating her Silver Jubilee in 1977 and Golden Jubilee in 2002 . And in 2012 , I am watching her celebrating Diamond Jubilee of her coronation . The fact that she is the second longest reigning monarch of United Kingdom and within 3 years she will become the longest reigning monarch of United Kingdom , is very exciting for me . 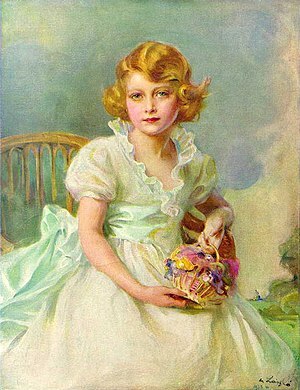 I think , I will be witness to that epoch – making event also , when she will become the longest reigning monarch of United Kingdom . Or who knows , she might outlive me also as she outlived so many people . Vidur's Random Musings on Issues of Indian Politics, Indian Films & Various Other Topics of Importance.